Description: Central Asia. Early black and white woodcut. Description: Tartary. Miniature map. Coloured. Description: Early map of Tartary based on the 1595 atlas of Gerard Mercator. Misconceptions (Korea as an island, an incomplete Nova Zembla) give an understanding to how little knowledge Europeans had of North-East Asia at this time. Coloured. 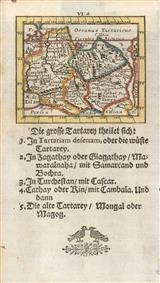 Description: Early map of Tartary. 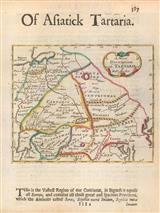 Published as part of Hakluytus Posthomous or Purchas his Pilgrimis, contayning a History of the World in Sea Voyages and Lande Travells, by Englishmen and others. Coloured. Description: Tartary. Cloppenburg Edition. Coloured. Description: Early map of eastern Asia, much of which is based on the journals of Marco Polo. Major settlements along the Silk Road are mapped as is Shangdu (Xandu), the seat of Kublai Khan. Original hand colour. Description: Tartary. Miniature map of region. Coloured. Description: Tartary, an important 17th century map of central and northern Asia. The four vignettes along the top margin highlight trade destinations on the silk road. Description: Tartary. Ornate cartouche. Coloured. Description: Asiatic Tartary. Decorative cartouche. Coloured. Description: Tartary. Large decorative map of Tartary, showing The Great Wall of China and new discoveries in Yedso (now Hokkaido). Original Colour. Description: Greater Tartary. With German text. Coloured.